Above: A publicity picture of pretty Noel Neill in Superman (Columbia, 1948). Noel Neill is one of the few serial heroines whose chief fame comes from her non-cliffhanger work. As Lois Lane on the 1950s Adventures of Superman TV show, she became an icon of early television, and remains a well-known figure to the generation that grew up with the Superman show–and to popular-culture buffs of any age. Her cheerful jauntiness, impertinent smile, and wryly humorous voice fitted her perfectly for the role of Lois; her perky charm was so strong that it could always take the edge off the character’s annoying traits–such as Lois’s perpetual rudeness to Clark Kent and her tendency to recklessly endanger herself. Before winning her television fame, Neill first tackled her signature part in two Columbia serials, and brought her endearingly chipper presence to two of Republic’s cliffhangers as well. Noel Neill was born in Minneapolis, and developed an interest in show business during her high school days, receiving professional training in singing and dancing. Her father, a Minneapolis newspaper editor, wanted Noel to become a reporter (ironic, in light of her most famous acting role), but after finishing high school, she journeyed to California in 1938. With the help of a songwriter (a friend of a former Minnesota neighbor), the aspiring actress landed a job as a singer at the Del Mar Racetrack restaurant, where she worked for two years. In 1940, Bing Crosby, a part-owner of the racetrack, noticed her, was impressed with her, and got his agent brother Larry to sign her as a client; this was the beginning of Noel’s Hollywood career. For most of the 1940s, she worked as a contract player at Paramount Pictures; the studio featured her in small parts in various movies and frequently loaned her out to independent producers like Edward Small, Hal Roach, and–most importantly–Sam Katzman. Her vivacity and her youthful looks had earned her plenty of background parts in teenage movies like Paramount’s hilarious Henry Aldrich comedies; these films in turn led Katzman to award her a regular supporting role in his own low-budget attempt at an Aldrich-like series, the Teenagers comedies. The Teenagers pictures, released through Monogram, starred Freddie Stewart and June Preisser as leaders of a group of high school kids, and co-starred Neill as Preisser’s sister. The Teenagers outings were the first films in which Neill received prominent billing and significant screen time; the series numbered seven films in all, from 1946’s Junior Prom to 1948’s Campus Sleuth. Noel, still on contract to Paramount, continued playing bit parts in their films while working in Katzman’s Teenagers series; during this time, she also made her first serial appearance, in one of the chapterplays that Katzman produced for Columbia Pictures. This first cliffhanger role was a minor but noticeable one; Brick Bradford (Columbia, 1948) featured Noel as a volatile (and inexplicably light-haired) native islander named Lulah, who encountered the serial’s good guys during their time-machine trip to the 1700s. She first popped up in Chapter Seven; initially (along with the rest of her tribe) she showed hostility to heroes Kane Richmond and Rick Vallin , but was bribed (by means of a “magic” cigarette lighter) into helping them locate a buried treasure in Chapter Eight; however, she turned on them again at the end of this episode, and subsequently rallied her fellow-natives to attack the time travelers in Chapter Nine (and the end of which Vallin and Richmond escaped to their own era). Above: Noel Neill shows (from left to right) Stanley Blystone, Kane Richmond, Rick Vallin, Frank Ellis, and Al Ferguson where to dig for treasure in Brick Bradford(Columbia, 1947). As the Teenagers series came to a close, Katzman cast Neill in her first leading serial role–that of Lois Lane in Superman (Columbia, 1948). This cliffhanger starred Kirk Alyn in the title part, and featured Carol Forman as the villainous Spider Lady, who was after a powerful ray machine guarded by the Man of Steel. Persistent girl reporter Lois got caught in the struggle between the two, and together with Jimmy Olsen (Tommy Bond) was forever running into danger from the Spider Lady’s gang, keeping Superman very busy. While many of the Katzman-Columbia serials could be best described as dull, Superman was very enjoyable and possessed an above-average amount of energy, thanks in part to its strong cast. Alyn made a good Superman and a memorably quirky Clark Kent, and Noel did a fine job as Lois Lane, holding Alyn’s Kent in amused contempt but reacting to the exploits of Alyn’s Superman with wide-eyed adoration. Though forced by the script to play some pretty nasty tricks on Kent (including getting him arrested in order to beat him to a “scoop”), Neill played her part with such good-humored energy that her Lois seemed likable in spite of such moments. Above: Kirk Alyn and Noel Neill in Superman (Columbia, 1948). Above: Kirk Alyn has just rescued Noel Neill from a potential laboratory explosion in Superman. 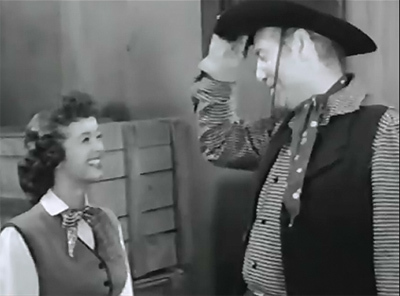 Almost immediately after Noel’s debut as a serial heroine in Superman, Republic Pictures featured her in their Western cliffhanger Adventures of Frank and Jesse James (1948), which starred Clayton Moore as Jesse and Steve Darrell as his brother Frank. Seeking to go straight, the outlaw brothers aided their old friend Jim Powell (Stanley Andrews) and his daughter Judy in developing a silver mine. The James boys hoped to use their share of the profits to pay back victims of their former robberies, but Powell’s mining engineer (John Crawford) discovered the mine contained gold instead of silver, and murdered Powell to keep the find a secret. With the help of a gang of outlaws, the crooked engineer tried to sabotage Judy Powell’s attempts to carry on with the mining project, but was thwarted by the James Brothers. Although it was built partly around earlier Republic footage, Adventures of Frank and Jesse James was an entertaining cliffhanger. Clayton Moore brought an appropriately grim intensity to the role of Jesse James, while Noel’s smiling, cheerful performance provided a good counterweight to his seriousness. Above: Noel Neill and Clayton Moore in Adventures of Frank and Jesse James (Republic, 1948). Steve Darrell is on the right border of the card, Moore on the left. Neill, by now released from her Paramount contract, played major parts in several films for Monogram Pictures (including a Jimmy Wakely B-western and a Charlie Chan film) before returning to Republic Pictures for The James Brothers of Missouri (1949), her fourth serial. Her role in this well-done chapterplay was decidedly similar to her turn in the preceding James Brothers serial; this time around, she played Peg Royer, the daughter of freight line owner and ex-James Gang member Lon Royer (John Hamilton). The James boys (now played by Keith Richards and Robert Bice) helped Peg fight off rival freighter Ace Marlin (Roy Barcroft), who had Lon killed and who did his best, backed by his secret boss Belle Calhoun (Patricia Knox) to drive the Royer line out of business. Neill’s effusive personality was even more important to the serial this time out, since both Richards and Bice delivered likable but very serious performances. She was particularly delightful in a scene where she flirtatiously distracted Roy Barcroft so Bice could sabotage one of Barcroft’s wagons. Above: Noel Neill chats brightly with Roy Barcroft in The James Brothers of Missouri (Republic, 1949). Above: Noel Neill and Keith Richards in The James Brothers of Missouri. Noel’s final serial was Atom Man vs. Superman (Columbia, 1950), in which she reprised her Lois Lane characterization; this time, she assisted Kirk Alyn’s Superman against the mad scientist Luthor (Lyle Talbot), alias Atom Man. While continuing to give Superman her unqualified approval in this new adventure, Lois seemed to have modified her dislike for Clark Kent and adopted a humorous tolerance towards him, which made it easier for Neill to make Miss Lane likable. Like its predecessor, Atom Man vs. Superman was unusually good for a Katzman serial; Alyn, Neill, Talbot, Tommy Bond, and Pierre Watkin (as editor Perry White) all gave energetic portrayals of the Superman comic book characters, but only Neill would have her entire future career influenced by her performance. Above: Noel Neill is threatened by “Atom Man” (Lyle Talbot, features obscured beneath that weird helmet) and Don Harvey in Atom Man vs. Superman (Columbia, 1950). Above: Noel Neill and Tommy Bond are unaware their plane is about to be targeted by the villains in Atom Man vs. Superman, but Kirk Alyn has noticed the danger. Noel co-starred in a few more B-westerns, played a few more bits in A-features, and guest-starred on some early TV shows like Racket Squad and The Cisco Kid, before returning to the Lois Lane role for a third time. In 1951, a season’s worth of Adventures of Superman television episodes had been filmed with George Reeves and Phyllis Coates as Superman and Lois, but the producers weren’t able to find a sponsor immediately and the episodes went unaired until the 1952-1953 TV season. When these shows proved a success, producer Whitney Ellsworth tried to reassemble the cast for a second season and found that Coates didn’t want to return to her part. Recalling Noel Neill’s earlier appearances as Lois Lane, Ellsworth hired her to replace Coates. Noel slid effortlessly back into the Lois Lane role in the 1953-1954 season, and continued as Lois until the show ended in 1958. After the show’s conclusion, Neill, knowing herself to be thoroughly typecast, retired from the screen. Beginning with the 1978 Superman movie, in which she had a cameo as Lois Lane’s mother, she made occasional screen appearances in Superman-related productions, including the 1990s Superboy TV show and the 2006 movie Superman Returns. She was also a frequent and much sought-after guest at film and comic-book conventions, and kept in touch with her numerous fans. She passed away in Tuscon, Arizona, in 2016, at the age of 95. Noel Neill’s enduring popularity has largely come about as a result of the Superman TV show, but she would never have joined the show’s cast if she hadn’t made her earlier serial appearances as Lois Lane. Thus, her serial vehicles served as the launching pad for her TV career, winning her a showcase which left a whole generation of television viewers with fond memories of her warm, slightly impudent, but good-humored screen presence. Above, left: Noel Neill as the serial Lois, with Kirk Alyn. Above, right: Noel Neill as the television Lois, with George Reeves. Acknowledgements: Much of the biographical and Superman-related information in this article comes from the Superman Home Page’s section on Noel Neill.